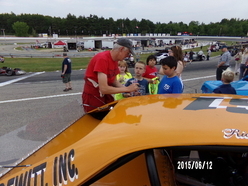 Senior Tour Auto Racers were on tap at the Lee USA Speedway in Lee NH on June 12th .. Cars hauled in from NY, CT, RI, Ma, NH, Me, and Canada. 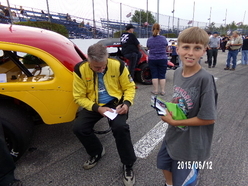 Star started their day with 2 rounds of practice and then Lee USA brought all divisions that night onto the track for an autograph session. 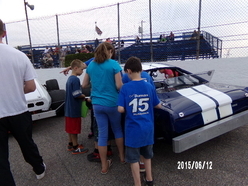 Lee opened up the gates to let the fans come down to meet all the drivers and view the cars up close. 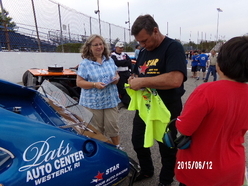 It was great to see the Star members signing autographs on tee shirts, photos, and flags and talking to the fans. The children were getting a big kick by sitting in the cars but I think the drivers got just as much a kick out of it as the children. 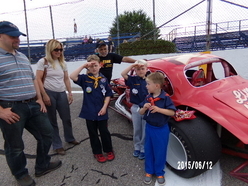 Then it was off to racing! 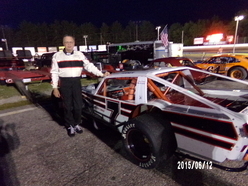 Star was scheduled for heats and features. 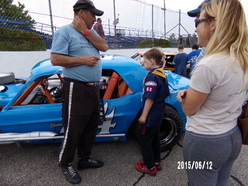 With Mother Nature breathing down with the threat of rain, it was not sure if the racing would get in or not. 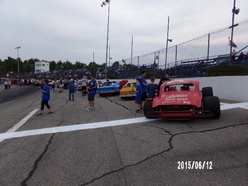 The Modifieds were lined up and ready to hit the asphalt for their heat race. 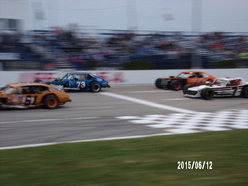 It was a photo finish as Ed Mulligan from RI in his #61 Pinto drove to the win with Scott Poirier from Ct in his #73 Pinto just inches away to take down a second. 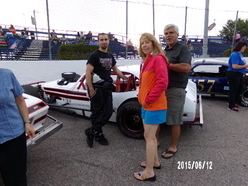 Right behind Poirier was Jocelyn Laliberte from Quebec, Canada to top the pack of with a third. When it was time for the features it was not sure it Mother Nature would hold off or not. STAR hit the track for their features. 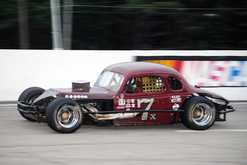 It was Bobby Turner from Me in his #7 Pinto to take down the checkered and victory for the Modifieds that evening. 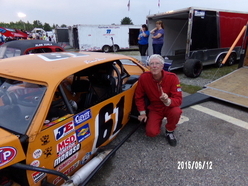 Scott Poirer from Ct in his #73 Pinto pulled another close second for the evening and to finish off the pack with a third was Jocelyn Laliberte from Canada with his #61 QC Pinto. 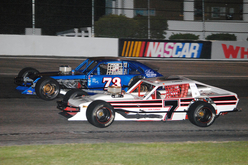 In the sportsmen division it was Skip Stearns from NH in his #7X coupe to take the victory for the Sportsmen division. 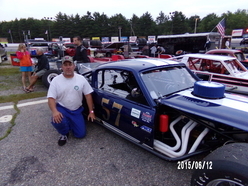 Robert Harless from NH in his #8 sedan finished second and topping of the pack with a third was John Mulcahy from Ma in his #57 Mustang. 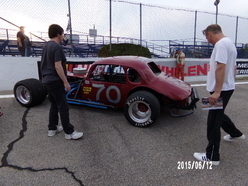 The skies were getting darker and darker so Lee USA Speedway by passed all on track interviews and continued racing to beat the rain. 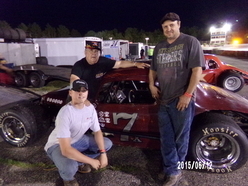 Trophies were awarded to the top three in the Modifieds and Sportsmen in the pit area. The races continued and all racing got in that night, but as we pulled out of the pit area to head for home the rain started to come. 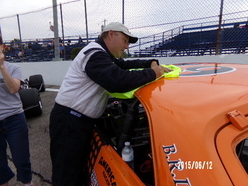 Racing ruled and beat Mother Nature that night! 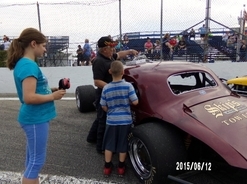 Senior Tour Auto Racers would like to thank Lee USA Speedway and their entire staff for all their hospitality and a “Great Night of Racing”. 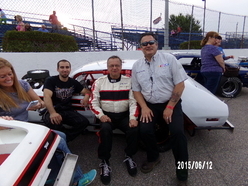 Star will be returning to Lee USA Speedway for their second appearance on August 28th.